I think I like it because it’s appropriately convicting, yet practical as it offers concrete instruction. I’m not trying to make any blanket statements about where or how a woman chooses to work. Whether you are working outside the home full-time or part-time, working a business at home, working full-time as a stay at home mom, or doing any combination of the above, you have a profound and primary influence on your house. When I began this blog, I really wanted to help women—particularly those who work at home or outside the home and those wanting to express themselves either creatively or as entrepreneurs—find God’s specific callings on their lives. That’s still the goal of this blog: to help you take a look at how God has gifted you and where he has placed you, so that you can move forward, feeling his pleasure. And when we are foolish and deny or ignore those things that God has specifically placed in our lives? Our houses—in all senses of the word—start to crumble, and they do so by our own hands. For a few years now, I’ve taken my eyes away from my “house.” I’ve responded to a variety of stressors—including financial strain, my mother’s illness and death, the closing of our church and our family’s spiritual wanderings—in ways that haven’t always been “wise.” In the process, I’ve lost sight of God’s call for me and have been slowly tearing down my “house” with my own hands. This is manifest in many ways. My physical house (body) is the heaviest I’ve ever been. With my own hands, I’m tearing my organs and joints down. My dwelling place (structure) is in some disrepair. We’ve got shingles falling off the roof, ratty landscaping, and carpets in desperate need of a shampoo. The toilets stay dirty and the laundry stays piled. The Holy Spirit’s house (my heart) has wandered back and forth between faithfulness and disobedient idolatry. My sin tears down my house. I know we didn’t get here overnight, and I know there are some issues that have complicated root causes. I’m also not saying that having comfortable lives is equal to having x amount of faith. What I am saying is that being wise begins with turning our backs on our sin and seeking the Lord. So, look in your houses, friends. What’s out of whack? 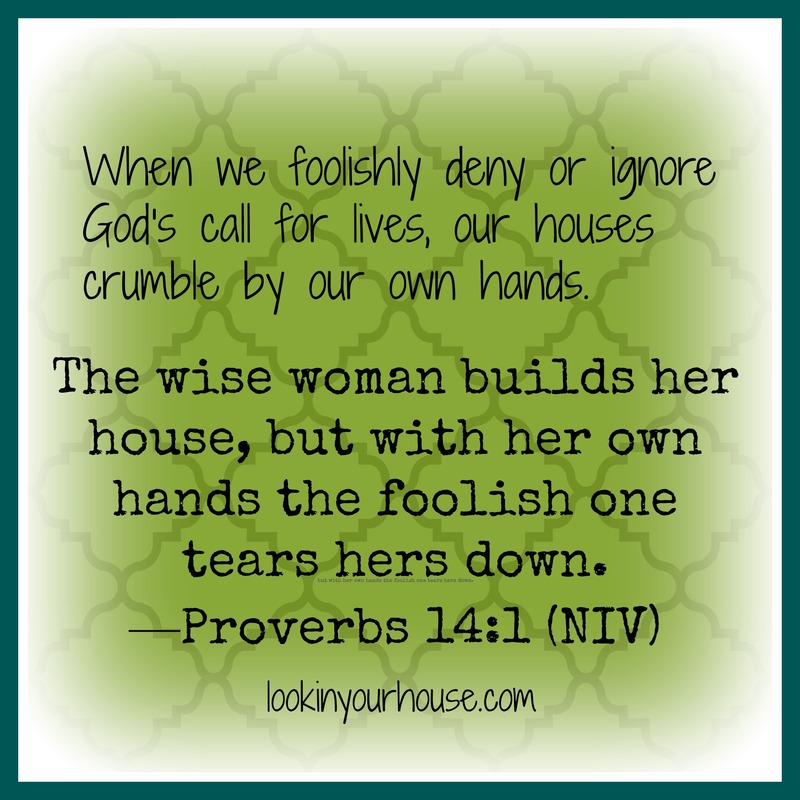 How are you tearing down your house with your own hands? Seek God, find wisdom, and build up your house. A great way to do this is by joining me for a book study on FaithLeaps by Alyssa Avant. It’s now available for Kindle on Amazon here. It officially launches March 12 with a fun party on Facebook and lots and lots of prizes. Details about the book study are forthcoming, but let me know in the comments if you’re interested. FaithLeaps is a great tool to help you peer honestly into your house. Please note: this post features an affiliate link. Should you use my link to make a purchase at Amazon.com, I will receive a small commission in exchange for my referral.